Hey guys and happy Friday!! I am soooo close to being done with the bathroom that I can smell it. I wanted to drop back in with another update this week. I’ve officially started laying the floors!! Since you guys are following along with me, I am here to show you how we laid the floor down, using backer board as the underlayment. Now as always during my process posts, I like to give you a disclaimer, this post is not pretty, but its honest. Laying backer board and tile is not fun, and my back and knees are still paying for it, but its so worth it. If you’ve been following along, you know that the last couple of weeks, you know that I revealed what my actual makeover plans were, painted the vanity and wall, trimmed the window, and gave you a sneak peek of the mirror. 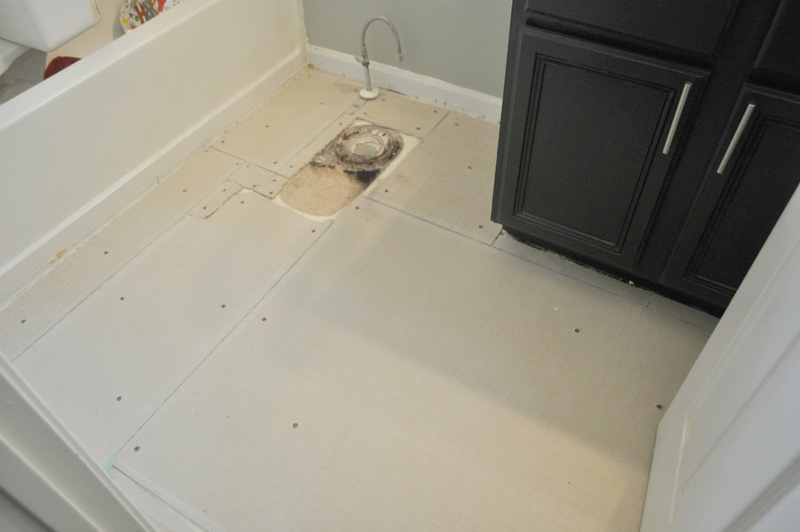 We opted not to remove the old vinyl flooring because backer board can be installed right on top. You may be asking, what the heck is backer board anyway? 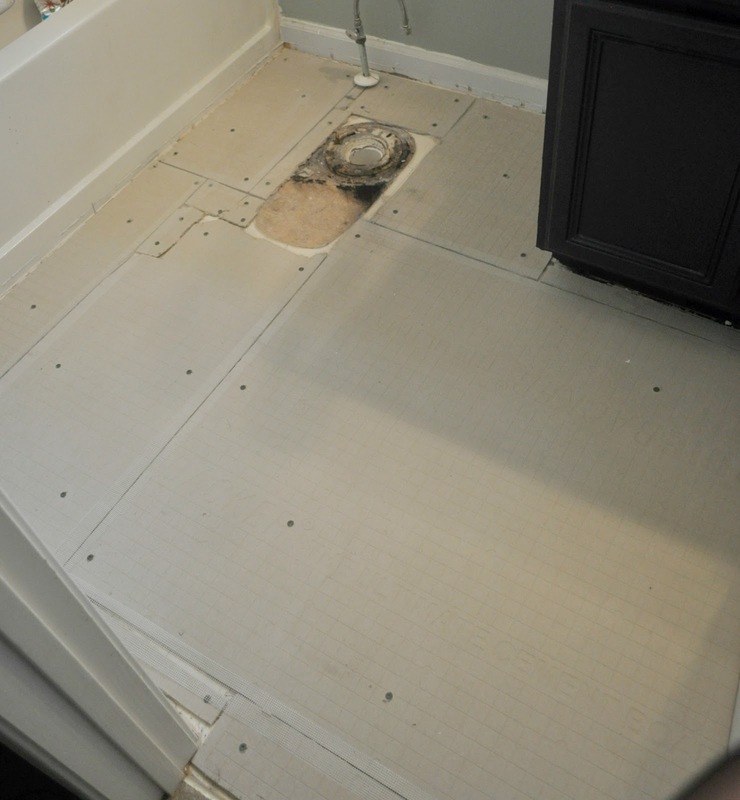 The purpose of backer board is to create a protective barrier between the subfloor and tile and keeps the tile from cracking over the years. It’s made of cement and fiberglass. 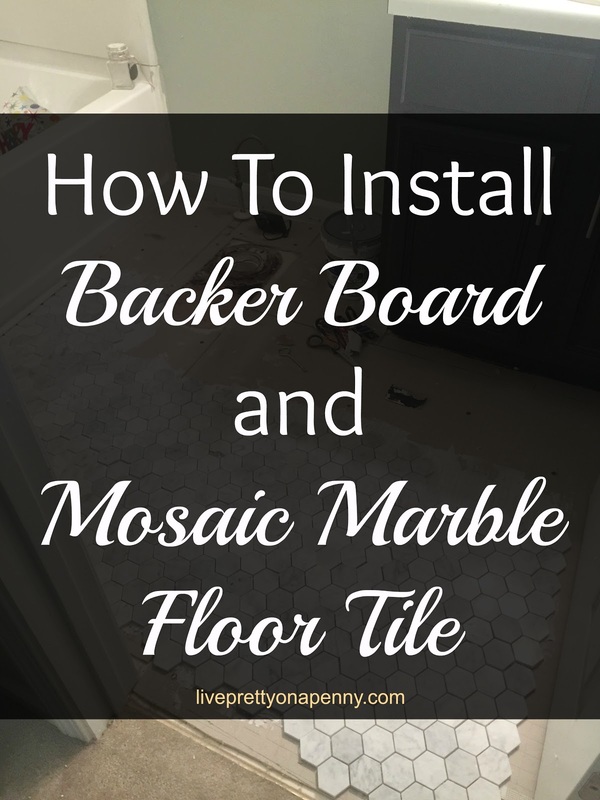 To install back board, you need backer board of course:), a backer board scoring knife, measuring tape, cement screws, flooring seam tape, and a drill. All of these items can be purchased from Floor & Décor. You then need to figure out the measurement of your space. 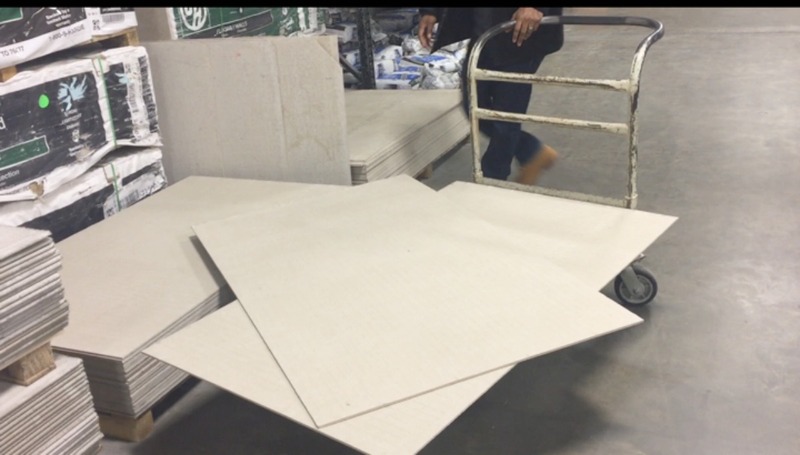 Backer board comes in large sheets so it will definitely need to be cut down to accommodate your space needs. Plus it doesn’t all have to fit together as you can see below. As long as it covers the floor. Here it is after its all screwed down. After we got the backer board down, I went over all of the separated pieces with flooring seam tape. You may have noticed the spacing of the back board from the wall. 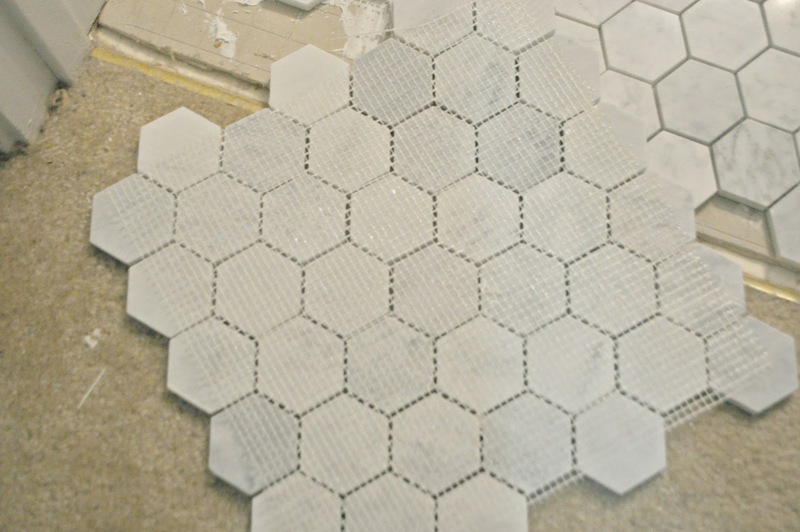 It’s 1/4 inch spacing to allow for the shoe molding along the edges once the tile is complete. 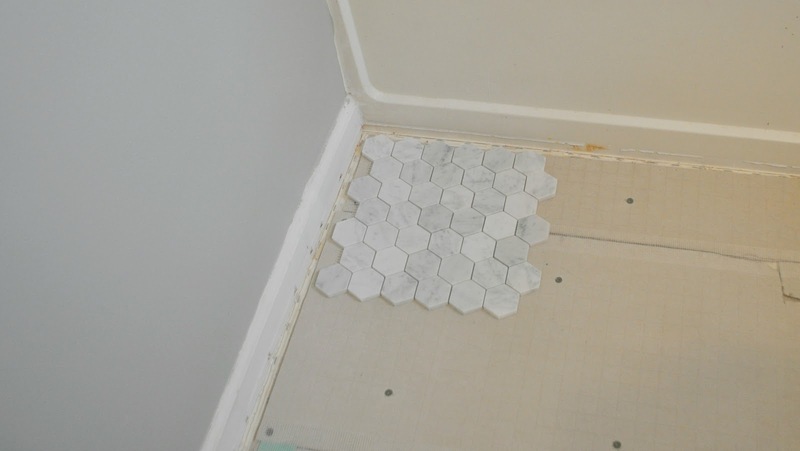 Shoe molding gives a finished look and closes any gaps between the tile and the wall. 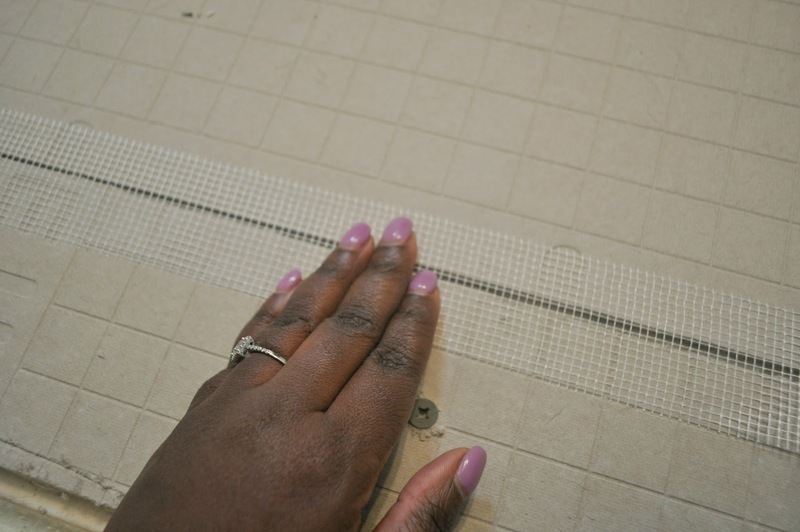 The purpose of the seam tape is to prepare the surface for proper tile adhesion in the areas where the backer board had been cut to fit. After installing the backer board, the floor is ready to be tiled! I swept all of the loose dust leftover from installing the backer board. If you remember when I did my kitchen backsplash, the tools needed are pretty much the same. 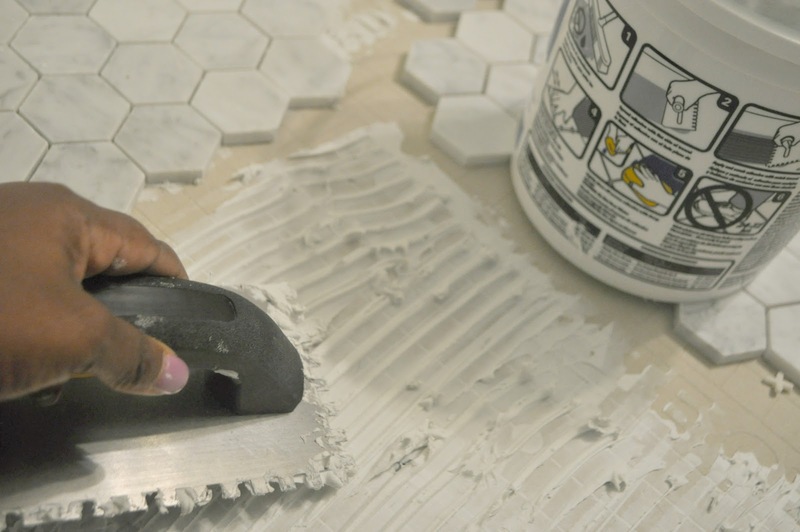 You just need to make sure that your thin-set mortar can accommodate the type of tile you are using. 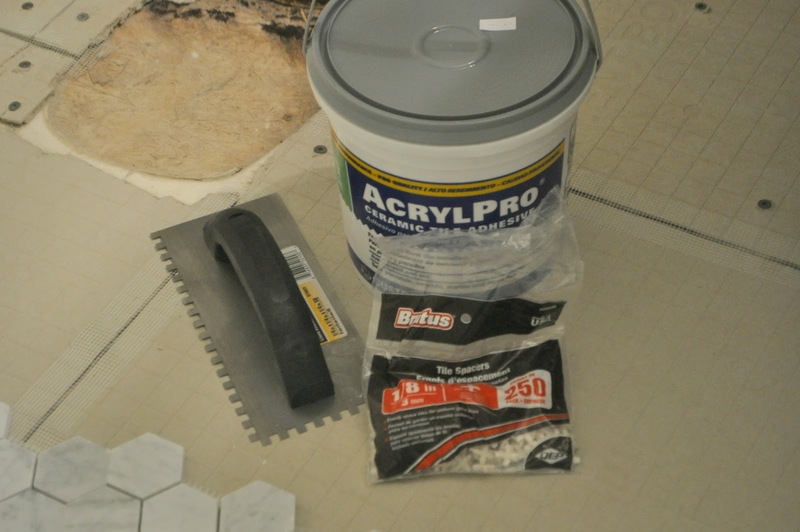 In this case, the mortar could be used with Marble, among other tile types. 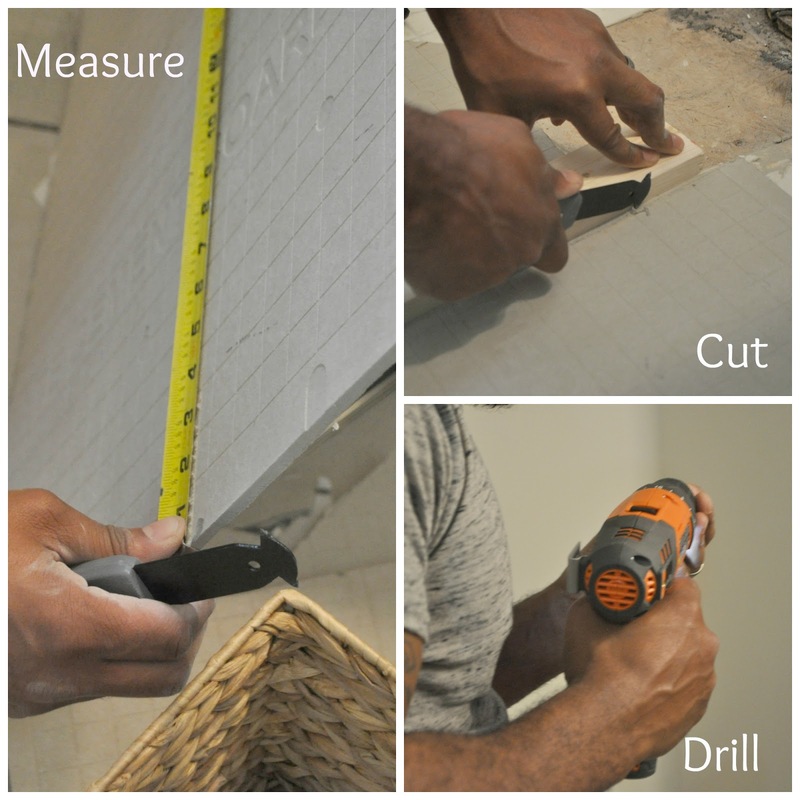 You will need a notched trowel, thin-set mortar, and tile spacers. 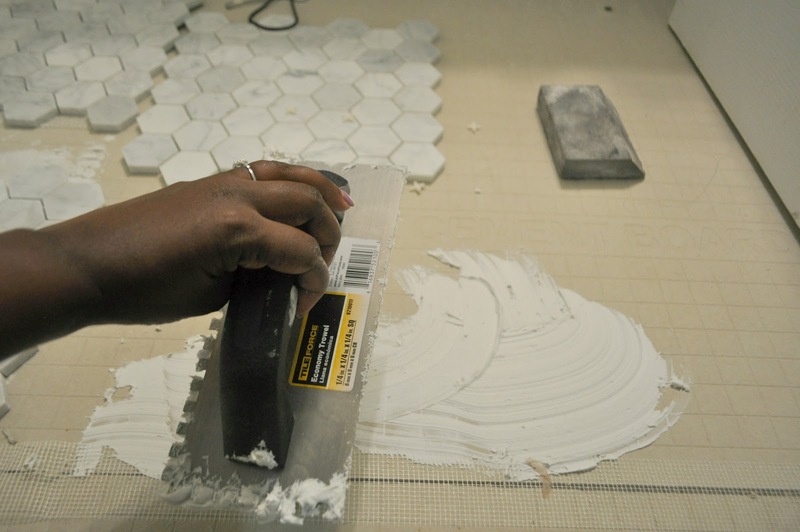 When using tile on a sheet, spacers aren’t a necessity, but I used them to separate each sheet. I then did a dry run of the layout and where it would be best for me to start. 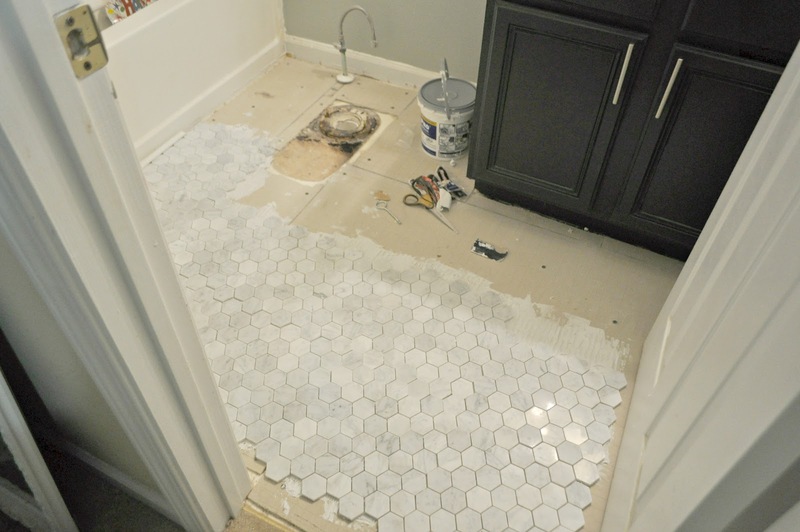 The dry run is super important because it lets you know if you will run into any weird layout situations prior to spreading the tile adhesive on the floor. 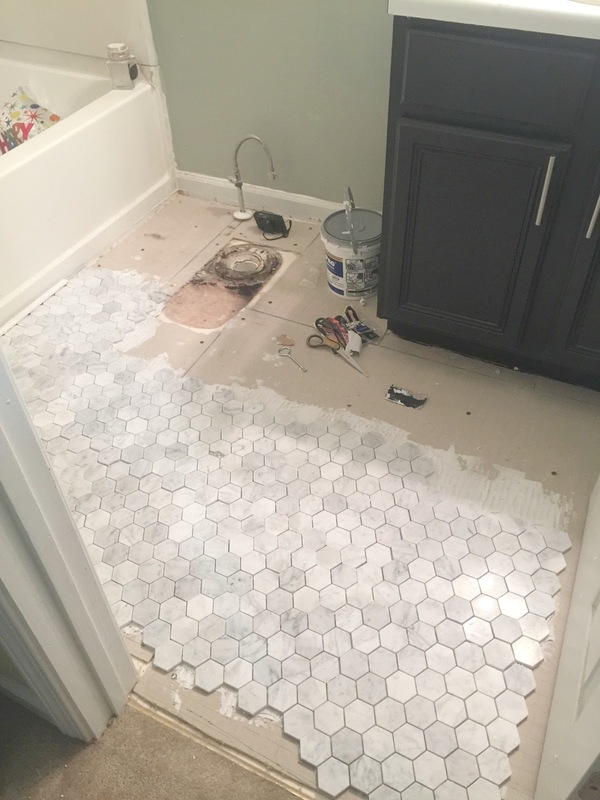 What I love about this tile is that it comes together on a sheet and fits together like a puzzle, but in some areas due to my flooring layout, I had to be a little more creative and pull individual tiles off the sheet to fit in certain areas. But it was simple. 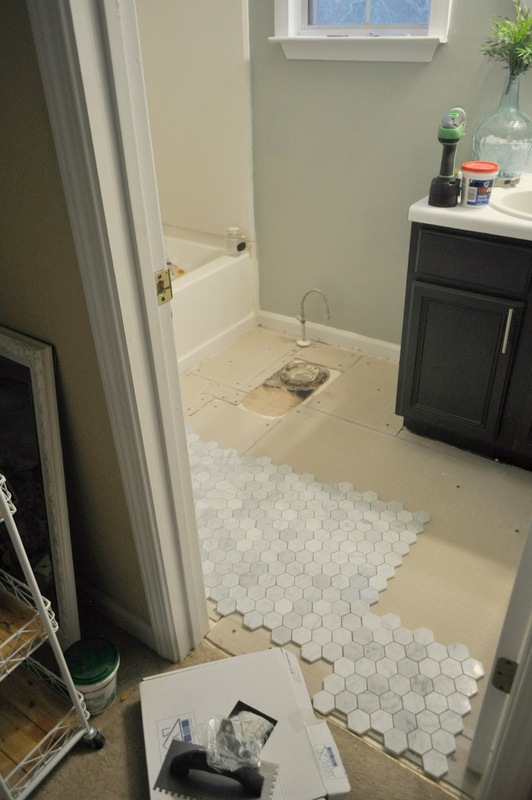 So after I did a quick dry run and checked out where I needed to make any changed, I began to lay my tile. To start, I scooped out the thin-set mortar using the straight edge of the notched trowel. Then I spread it across the backer board. Using the notched side, I gently scrapped through the excess. I repeated these steps until I completed the first area of the night and here is what I have so far. I plan to have the flooring completed this weekend and I will grout it next week! After I lay the floor, I need to let it sit without walking on it for 48-72 hours so that the thin-set can fully adhere, per the directions on the thin-set tub. I keep noticing so many little finishing things that I need to do and its making me tired just thinking about it, lol. But I am loving the results so far. So there you have it…another week of progress and another step closer to the finish line. Check out where I started here…. It looks fantastic. You are doing a great job!! Your floor is coming along so nicely! I really love the tile you chose. Looks great Erin! 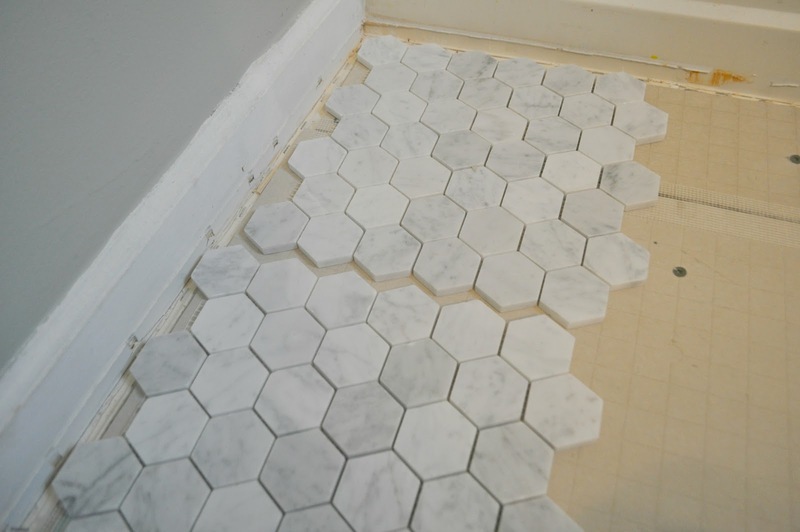 I appreciate this tutorial as eventually I want to update the floor in my bathroom! I love the step by step and can't wait to see it all together! Love the choice of tile Erin !! I can't wait to see your finished product !! Oh my gosh, love it so much! And girl you make it look so easy!